Art enthusiast. Loves painting, bushwalking and travels. Writing what I love sparks my passion. Sydney, Australia. Gosford/Edogowa Commemorative Garden is located on the shores of Caroline Bay in East Gosford, and it is included in Gosford Regional Gallery. 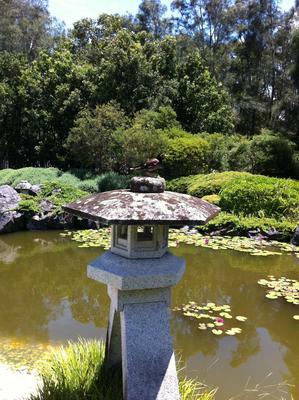 The garden is built in accordance to the traditional Japanese design principles. The surroundings of this unique Japanese garden are stunning, featured with a pond full of large bright koi fish, a roofed pavilion, teahouse and stone lanterns. 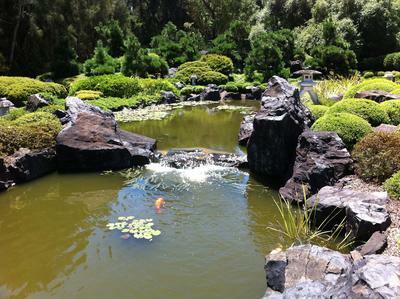 You can experience the ultimate sense of peace, tranquillity and relaxation when you are strolling through the garden. If you love drawing it is pretty handy that you can purchase a pre-packed sketching bag from the Gallery Shop. You can simply pick the best spot in the garden to enjoy your drawings and sketches. There is abundance of the scenic composition of the garden for you to choose from. 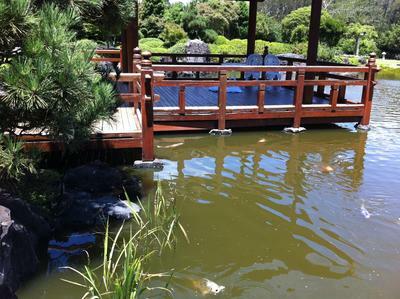 Set in the tranquil beauty of the gallery and the Japanese garden is the Caroline Bay Brasserie. After all, what better than an exotic afternoon tea at such a lovely place? Pamper yourself with a cup of aroma coffee and delicious cakes. If you are art lover, why don't you also take the opportunity to explore further with the Gallery. Elissa Ramsay Exhibition is to be open on 14 April at the gallery. Elissa Ramsay is a Central Coast based artist who works in unique style, creating mixed media landscapes and cityscapes with multiple layers of paint, printed images, rusty nails, electrical wires and found objects, with each layer covered in resin. Her works are bold and vibrant, giving you a lot of inspirations. Although the gallery does not have a permanent collection, its diverse exhibition program showcasing various media on an ongoing basis is definitely an attraction for you to revisit. Keep an eye on their upcoming program and you'll find your day well rewarded with stimulating experience. Wendy, you caught the spirit of the garden perfectly. I have been there several times, as I live on the Central Coast and it is one of our most beautiful places.